Augusta County Library can always use your help, whether it’s by donating your books, becoming a Friend of the Library, designating the Friends when purchasing items through AmazonSmile, or volunteering your time. Your library thrives on donations! Whether it’s a monetary gift or a box of used books, every little bit helps. Financial Gift: Charitable gifts to the library are processed through our nonprofit partner, the Friends of the Augusta County Library. Bequest: Leave a legacy to your community by remembering Augusta County Library in your will or through your life insurance policy. Your gift will be added to an endowment fund with the Augusta County Library Foundation or you can specify a specific program to support. Used Books: Through the Friends of the Augusta County Library, we are able to accept donations of gently used books for our collection and the Friends Book Sale. Learn more. The Friends are civic-minded people from all walks of life who care for and take pride in their local public library as a cultural institution. They make personal contributions of money to the library through the Friends organization. Some contribute hours of work each month to help the library function or to make its grounds more attractive. Others will serve as public advocates when library needs are being considered by governmental entities. With the help of the Friends, Augusta County Library offers vibrant family events, provides staff with ongoing training to increase their knowledge base, and much more. Visit the Friends’ website to learn more about becoming a member. We simply couldn’t do it without our Friends! Do you like meeting new people? Giving back to the community? If you said yes, then you might be the person we need to help at one of our five locations. The benefits of volunteering are many, whether you are young and need to gain work experience, or you’re retired and want to share your expertise with others. 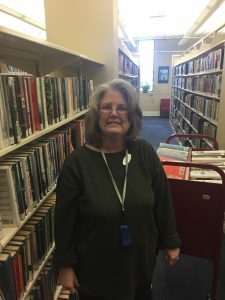 Your local libraries depend on dedicated people to shelve, teach classes, cover books, help with events, landscape, assist with book sales, and a variety of other jobs. Our Fishersville Main Library does not have any current openings for new volunteers. If you would like to be considered in the future, please contact Volunteer Coordinator, Doug Keith at 540-885-3961 or dougkeith@augustacountylibrary.org. If you’d like to volunteer at one of our locations in Churchville, Craigsville, Deerfield, Middlebrook, or Stuarts Draft please contact that location directly.